The National Center for Atmospheric Research Earth Observing Laboratory uses Digital Object Identifiers (DOIs) to promote attribution of EOL-hosted Lower Atmospheric Observing Facilities (LAOF) and datasets. We do so to recognize the work and creativity of dataset authors, follow modern data citation practices, obtain reliable metrics, and implement reproducible research practices. This document provides guidance for authors on citing EOL LAOF and datasets both within the body of a publication, and well as in the references section. These guidelines take guidance from the Harvard citation style and other sources referenced at the end of this document. If you are submitting your publication to a journal, please be sure to follow their required guidelines. Within the EOL data archive, each dataset landing page (homepage) contains a link to order/download the data. UCAR/NCAR - Earth Observing Laboratory. 2015. AeroLaser Vacuum Ultra Violet (VUV) Fluorescence In Site Carbon monoxide (CO) mixing ratio, Version 1.0. UCAR/NCAR - Earth Observing Laboratory. EamAccessed 01 Sep 2016. The citation also includes a link to reformat the citation to meet the requirements of many common journals. Click on “Additional Citation Styles” to open a new page section. Select the journal you are submitting to, and the page will auto-generate a cut-and-paste citation specific to that journal. This feature depends on the external CrossCite service and so may not always be functional. It is an automatic metadata formatting procedure and may need cleanup or fine-tuning to be usable. Please review the provided citation against journal requirements. Citations include a version number. If a dataset landing page does not list the needed version as the current version, please email the primary point of contact listed on the page, explaining why access to the data is needed (such as for reproducibility) and we will provide the needed data. As the current version is the version that should be used for all research publications, previous versions are not available online. This is to avoid confusion and accidental publication of the wrong data. UCAR/NCAR - Earth Observing Laboratory. 2015. 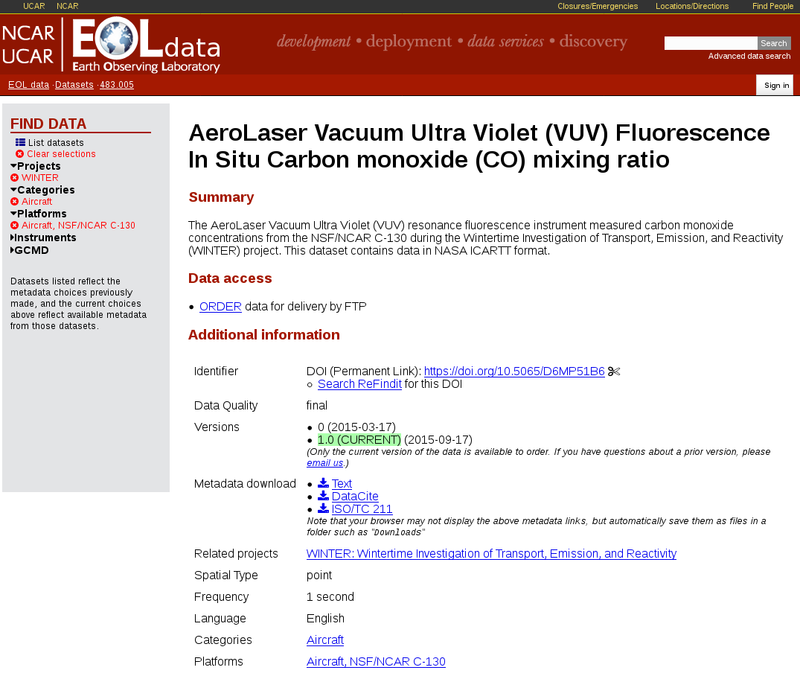 AeroLaser Vacuum Ultra Violet (VUV) Fluorescence In Site Carbon monoxide (CO) mixing ratio, Version 1.0. Subset used: Flight RF01 UCAR/NCAR - Earth Observing Laboratory. https://doi.org/10.5065/D6MP51B6. Accessed 01 Sep 2016. The above citation does NOT include the field project name. It is given on the dataset landing page and within the DOI metadata. If citing data from multiple field projects for a single instrument, the user may wish to explicitly specify the field project name in the dataset title. To cite an EOL dataset in the text of a publication, spell out the full organizational name in the text immediately before the citation or within the parenthetical citation the first time the source is cited, followed by the organizational abbreviation in brackets. Use only the abbreviation in subsequent citations. When citing multiple EOL datasets collected during the same year, append lowercase letters to the year to distinguish the different datasets in the reference list. Please be careful of line breaks when cutting and pasting the above text, and feel free to reformat to fit your document. Additional citation styles are available at DataCite or CrossCite. DOIs have been assigned for the following LAOF. Please note that we are in the process of getting the citations onto the bottom of all landing pages and should have this complete by 30 September, 2016. If a page doesn’t show a citation, please contact us for information. Facilities (platforms and instruments) should be cited in the text the same way as datasets, e.g. (EOL 2016). See the section on Citing a Dataset in the text above for details. To cite a dataset that does not currently have a DOI, please email eol-datahelp@ucar.edu and include a link to the dataset landing page. EOL staff will work with the dataset PI to get a DOI assigned and notify you when it is ready. EOL is in the process of developing guidelines for citing software and workflows. As that work is completed, guidance will be included here. In the meantime, please email eol-archive@ucar.edu and we will work with you to get what you need. In addition, the American Astronomical Society has some guidelines on citing software that may be informative.